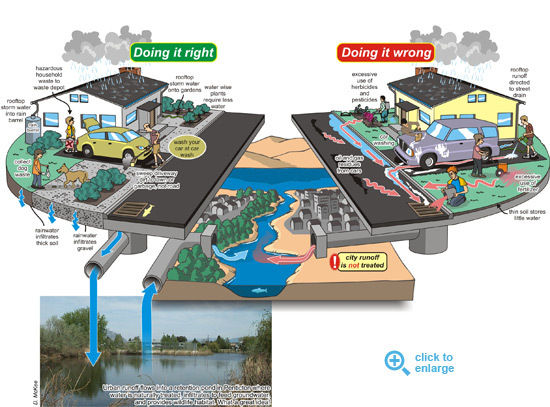 Okanagan WaterWise - Learn More. One valley. One water. The Okanagan Basin is connected through our interdependence on a single water supply. There is only one water. We drink it. We swim in it. We depend on it for our food production. Where does the water in the Okanagan Valley come from? 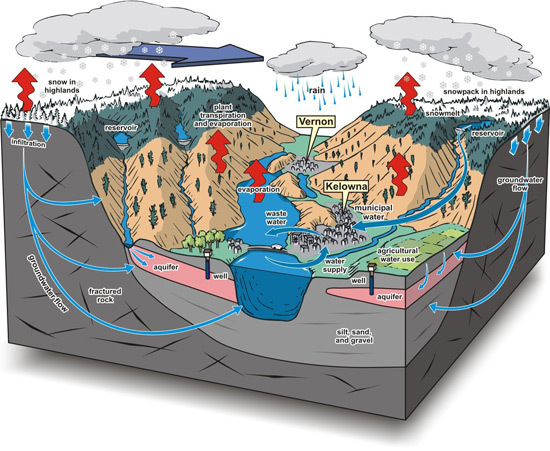 All water that enters the Okanagan Basin comes from precipitation in the form of snow or rain. However, the Okanagan is in the rain shadow of the Coast Mountains. So although we are pretty close to the Pacific Ocean and naturally wet cities like Vancouver and Victoria, we get very little precipitation. Most of the moisture from the Pacific Ocean leaves the air as precipitation before it can reach the Okanagan. This is why the Okanagan actually has the lowest amount of fresh water available per person than almost anywhere in Canada! ...That even though it looks like we live in a water rich area. If we use more than nature can replenish through rain and snow, we will run a deficit. Think of it as spending more money than you have coming into your bank account each month — eventually you'd run out of savings, and you'd be broke! The snow, after it melts, and the rain we receive seep into the ground and become groundwater, or join the series of small creeks that flow into our lakes. Water leaves the Okanagan through evaporation and through the flow of the Okanagan River to the south. In fact, all water in the Okanagan flows south. This means that water in the South Okanagan might already have been used by several people in the North Okanagan. Residents of the South Okanagan are called "downstream users," and what happens upstream from them can have huge effects on their water supply. Where does the water in my tap come from? Every community has a different source of water. Some communities use upland resevoirs, that look and function like lakes, as their water supply. Some towns and cities draw water straight from the big lakes, including Okanagan Lake, Kalamalka Lake, and Skaha Lake. Other communities use wells that take water from underground pools of water called aquifers, and some places draw their water from flowing creeks. Water from any of these sources is vulnerable to pollution. The diagram below shows some ways we can protect our water supply; for ourselves and our downstream neighbours! 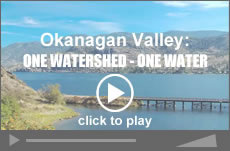 Below is a short video which explains the critical interconnection of the Okanagan Valley's water. Enjoy! Watch the journey water takes from the source, to our taps, and back to the source.